Pancit Malabon and pancit palabok or pancit luglug are to my knowledge two different but related pancit. Pancit palabok ingredients consist of four parts. The luglug which is the noodle itself, it is the regular bihon noodles soaked in water then blanch in boiling water or stock. The palabok is the thick sauce which is made up of shrimp juices thickened with cornstarch and colored bright orange with annatto. The paalat which is the salty broth made up of again shrimp juices, diced tufo and ground meat and colored bright orrange with annatto. And the toppings or garnishing of shrimps, smoked fish flakes, pork crackling ect. 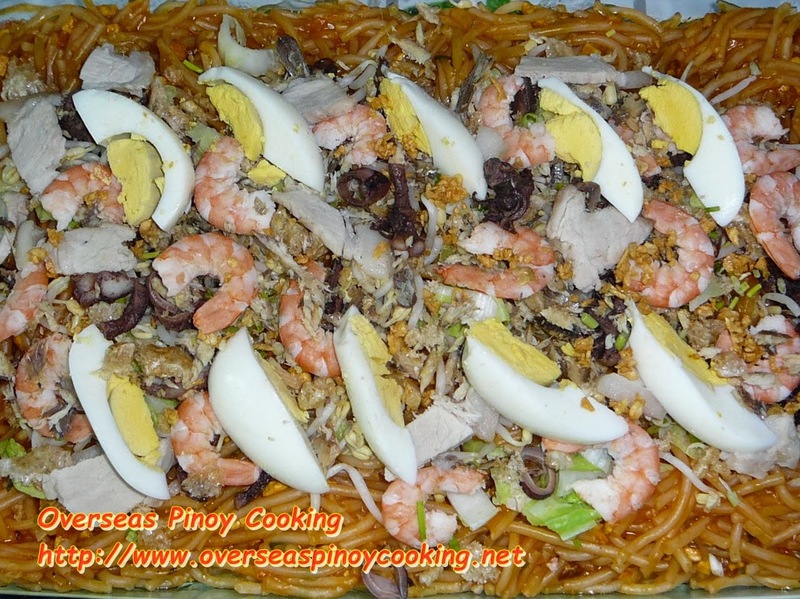 Pancit palabok is served by arranging the blanched or boiled noodles in a platter then topped with the palabok then the paalat is poured over the palabok and finally the garnishing. Pancit Malabon on the other hand uses thicker rice noodle or bihon like spaghetti. It is also soaked in water and blanched in boiling water. When ready to serve the noodles, paalat and palabok are quickly cooked together so the flavour of the sauced is infused to the noodles. The saucy and bright orange colored noodles are then arrange in a platter and topped with the garnishing. Both pancit share the same toppings of shrimps, hard boiled eggs or pork cracklings, smoked fish flakes and chopped spring onions and kalamansi on the side. However, pancit Malabon gets an extra topping of seafoods like oysters and adobong pusit, salted eggs and vegetables like mung bean sprout and pechay Baguio. In a large sauce pan, sauté onion and garlic. Add ground pork and stir cook for 3 to 5 minutes or until meat turns to golden brown, add in tofu, patis, kinchay and annatto water, stir cook for another 3 to 5 minutes. Add in shrimp juice and let boil, simmer for 5 to 10 minutes. 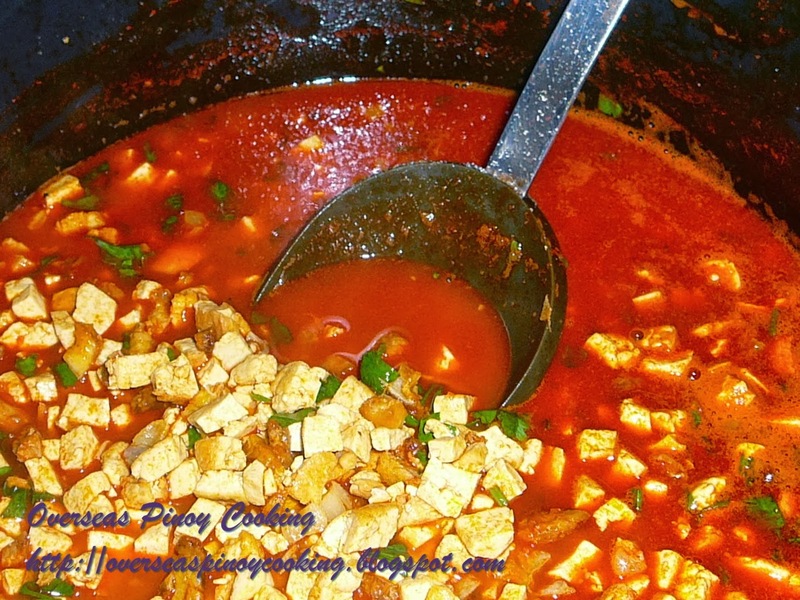 Thicken sauce with cornstarch diluted in 1/2 cup of water, keep warm and set aside. When ready to serve put cooked bihon noodles in a big heated wok, pour in sauce and stir cook for 5 to 8 minutes or until sauce has fully infused with the noodles, add more shrimp juice or water as necessary. Season with salt and pepper to taste. Removed from wok and arrange noodles in a big platter. Top with the garnishing ingredients and serve with kalamansi. 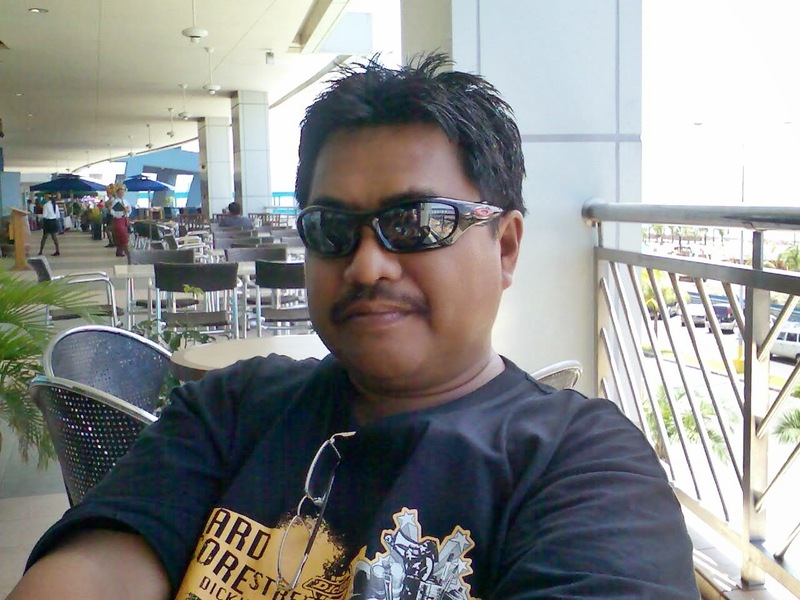 See related Pansit Malabon Post. See related Pansit Palabok Recipe. hi! Your pancit malabon sure look good. Ano po ba ang pagkakaiba ng pancit malabon sa palabok? Hello! Can I use the White King Shrimp Sauce mix (pancit palabok) for pancit malabon sauce? I have not tried it my self but I guess it's ok.
where is the palabok sauce recipe ? i only see the paalat sauce ? For this recipe the paalat and palabok are cooked together for the reason that I wanted the cooking process more simple. Pansit Malabon is best prepared with the sauce and other ingredients except the garnishing be cooked together so the flavors are infused to the noodles. Should you wish your paalat and palabok prepared separately, you have to cook and thicken the shrimp juice separately, similar to Pansit Palabok. what did you put why it turned color orange??? The red-orange color is from the annatto seeds extract (atsuete). Wow that’s where all those textures came from, I didn't know till now thanks for sharing, truly appreciated. I have not tried it myself but others have tried it with good results. Hello ut-man! I tried your Pancit Malabon last weekend. Success!!! Maraming salamat for sharing your recipes with people like me who are matakaw pero hindi marunong magluto LOL. BTW I could not find the proper noodles so I used spaghetti. That's how good your recipe is, that even with spaghetti it works! Thanks for your feedback, it's great the recipe realy works with others.